Philip Howell's Brilliant New System to decide how many people Australians want: "We will decide"
A New South Wales lawyer, Philip Howell, has written a brilliant new democratic strategy to decide from the local level upwards, how big we the people want Australia's population to be. As a population sociologist who compares international systems on this matter, I am really impressed and can only encourage everyone to support this man's remarkable contribution to our democracy and wellbeing. Look at his site for more detail on reforming our constitution. Read more about Philip Howell's Brilliant New System to decide how many people Australians want: "We will decide"
The Panel assembled a legal team of Sydney senior and junior counsel instructed by international law firm, DLA Piper, to apply to the ACT Civil and Administrative Tribunal this afternoon on behalf of Australian Society for Kangaroos to injunct the ACT kangaroo cull due to commence it was thought this evening. During the hearing it was disclosed that the ACT had planned to commence the first round of shooting on Tuesday night. A permit has been issued by the Department of Environment and Heritage Protection to cull 2,000 Agile Wallabies at Mission Beach along the North Queensland Coast in an area almost pristine not so long ago. 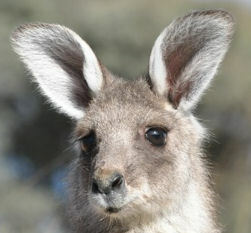 Wildlife activists say that there may only be about 500 wallabies there now but a lot more humans. Thanks to Julia Hewett for sending us this film of an elephant playing ecstatically in surf in India.